WITNESS is incredibly proud to have been named one of 10 Trailblazers among the Nominet Trust 100. We’ve been using technology since our inception in 1992, when co-founder Peter Gabriel and a handful of others set a vision to open the eyes of the world to human rights abuses. Back then the aim was to “give cameras to the world” so that survivors of human rights abuses could tell their own stories. We knew that if the world had a visual record of their experience, the violations couldn’t be denied or buried. 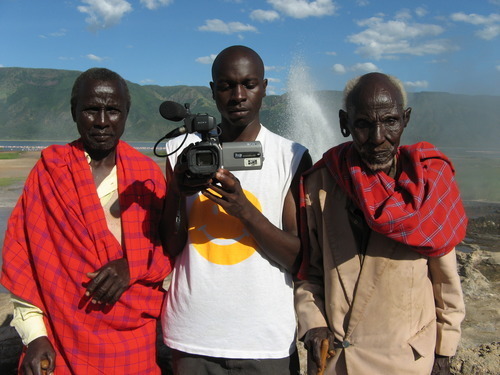 Members of the Endorois community film testimony to present to the African Commission on Human and Peoples’ Rights. Photo courtesy of WITNESS. And we did increase the visibility and impact of these stories. Since our founding, WITNESS has partnered with more than 300 human rights groups in 86 countries, trained over 4,500 human rights defenders, and supported the inclusion of video in more than 100 campaigns. WITNESS videos have helped restore lands to an indigenous community in Kenya, put a warlord behind bars for recruiting child soldiers in the DRC and passed the adoption of the first-ever legal protection for elderly Americans at risk of abuse. But we have recognized the need to reach millions more people. Yes, millions. Today, thanks in large part to mobile phone companies, the majority of the world’s population now has a camera in their pocket and people everywhere are turning to video to document abuse. But all too often their videos don’t make a difference. It’s not just a need to keep pace with technology innovation; we want to keep people safe and help ensure their videos make an impact. In critical situations we teach video basics, safe filming techniques, and how to create videos that stand a better chance of creating change. See our work in Brazil where activists are using video to document wide-spread use of forced evictions in the lead up to the 2014 World Cup and 2016 Olympics. We create and distribute toolkits, guides, tip sheets and even mobile apps to help keep activists and their footage safer. This month we launched a video series for interviewing survivors of sexual violence. Survivors’ stories are an important advocacy tool and we’re working to ensure they are captured in a way that is respectful and avoids re-traumatizing those willing to step forward and share their personal experiences. We advocate for technology and policy changes that can help anyone using video to defend human rights to do so with maximum impact and minimal risks. Last year we helped convince YouTube to incorporate a face-blurring tool into their online editor so that activists have the option of helping protect the identity of people who appear in their footage. WITNESS partners in Brazil document the story of a woman who was forcibly evicted from her home. Photo courtesy of WITNESS. Core to everything we do at WITNESS are our partners around the world. Our core constituents and partners include human rights activists and organizations, technology companies, and developers, supporters, donors, and the media. Without their input and feedback we would not be able to create the curriculum and tools to make a difference in the lives of individuals, families, and communities. We encourage social tech entrepreneurs to stay connected with all of their valued stakeholders, which helps ensure that they are developing projects and resources for which there is a need. 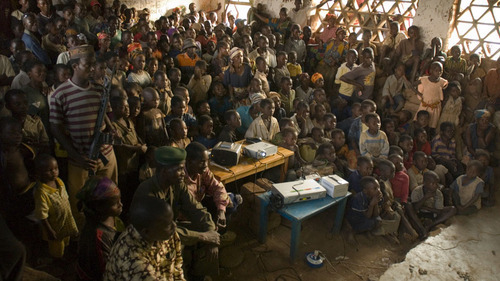 A screening of a WITNESS co-produced video for community in the Eastern DRC trying to prevent recruitment of children to local militias active in the area. Photo courtesy of WITNESS. The explosion of digital media means that almost anyone can bear witness to human rights atrocities. But challenges have emerged around anonymity, privacy, and retribution; how to determine the veracity of media being created by millions of people; how to highlight less visible stories and struggles with increasing volumes of content, to name a few. The demand for our services is greater than ever before. We have a great foundation in place to meet this demand – an international reputation, outstanding staff, a dedicated board, remarkable partners and a proven-successful video advocacy model. Our continued goal is to scale our programs and reach those millions of people with the right training, tools and support.